We’re less than a week from Christmas, so consider this blog my gift to you, because I don’t have your address and have no way of getting you anything else. I Knew It Would Make A Comeback, Just Like My Acid Washed Jeans… Wait, Says Who? Google has updated Maps for iOS, enabling the use of offline maps. That’s right, offline maps. Now who’s “the poor schmuck carrying an iPod Touch 4 that’s as useless as a twig at a lightsaber fight”? Is It Bad If It Takes Ten Minutes For The Form To Load? New York Attorney General Eric Schneiderman is asking New Yorkers to visit a site where customers of Verizon, Cablevision, and Time Warner can test their internet speed against what their providers have promised. Schneiderman is asking customers to submit a screenshot of the results and fill out an online form that asks 1) who their ISP is, 2) the speed they were promised, and 3) whether “Schneiderman” makes them think of the superintendent from the 70’s sitcom One Day at a Time, like the mayor keeps saying. If their connection doesn’t measure up to expectations, it’s probable that there will be hints for optimizing speed at the customer end, while if promised speeds are achieved, customers will be asked to explain if they feel their unholy deal with Beelzebub was worth it. Why Do The Seventh Graders Get Everything? Starting next week, the majority of drone owners will need to register with the Federal Aviation Administration. Pilots must provide their name, home address, and email address and be at least thirteen years old. The legally mandated five dollar registration fee will raise a token amount of revenue for the federal government, a total dwarfed by that amassed from the suddenly burgeoning market of 10- to 12-year-olds desperate for fake IDs. After airlines banned “hoverboards” (two-wheeled, self-balancing scooters)–deeming many of the batteries to be fire and explosion hazards–Amazon has stopped selling certain models until they can be proven safe. Some, myself included, believe this move would have been justified long ago, for all manufacturers, because, yes, fires and explosions are not great, but more importantly THEY AREN’T HOVERBOARDS! THEY DON’T HOVER–THEY HAVE WHEELS! I GUESS I’LL CALL MY SHOES HOVERSHOES! AT LEAST THEY LEAVE THE GROUND EVERY OTHER STEP! The Wheels Of Justice Turn Slo–They Are Turning, Aren’t They? Samsung has asked the Supreme Court to hear their appeal of a smartphone patent dispute with Apple that began over four years ago, and was initially decided in Apple’s favor over three years ago. The Supreme Court asked both parties to be patient, and will consider whether or not to hear the appeal as soon as they finish with Tesla v Edison. There are reports that Homeland Security is planning to examine the social media accounts of foreigners applying for visas. They would presumably eliminate applicants for references to terrorist ties, while the remainder would be forwarded to a committee flagging occurrences of “Kardashian,” “Real Housewives,” and the barest hint of The Force Awakens spoilers. So About Three Inches Of Mulch, You Say? Speaking of Star Wars spoilers, a new Chrome extension called Force Block will block web pages containing spoilers for The Force Awakens, instead loading a screen with a Star Wars joke. This allows those of us who have not yet seen the movie to freely navigate the remainder of the web–an archive of geocities gardening blogs last updated in 2003. Do I Need A Watch To Count The Steps From My Bed To My Couch And Back? Pebble has introduced Pebble Health, their first foray into fitness-tracking. Initially it will track only steps and sleep, but hopes are that the first update will start to allow comparisons between the two, and when minutes of sleep exceeds number of steps, it will immediately sync to your phone and block access to the GrubHub app. Rumor has it that Google plans to use its self-driving cars in a ride service that would rival Uber. There are further rumors that the autonomous car division will become a stand-alone company under Google parent Alphabet, proving definitively that they care nothing about my feelings. If they did, the cars would remain under Google and the Uber competitor would be named Goober. Facebook announced that Messenger will have a Transportation option in the More menu, allowing users to access ridesharing services. Currently, Uber is the only provider, but Facebook expects to add more in the coming months, and down the road one would expect to see Goober. Yeah, I’m calling it that, whatever they decide. Need to get a gift for someone, but worried that it won’t arrive by Christmas? Well, I’ve got the answer. Worried that they might not fully appreciate a book filled with technology nonsense? Well, it will arrive by Christmas. The Internet is Like a Snowblower (And 200 Other Things I Got Wrong About Tech This Year) is a collection of the year’s Weekly Tech Views, is available immediately for the Kindle or Kindle app, and, at $2.99, is 40% less expensive than a drone pilot registration (yet contains many more words!). 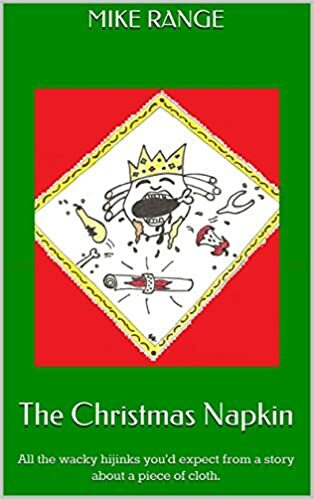 And if you’re looking for a short holiday story that I’m going to classify as “humorous,” (there’s really no other option for the origin story of a Christmas napkin) for the bargain price of FREE, The Christmas Napkin will be exactly that price this coming Thursday and Friday, Christmas Eve and Christmas Day. After all, there’s no rule saying you can’t read this AND The Night Before Christmas.